Hello everyone! Today, I'll be live over at PinkBuckaroo Designs Facebook Page at 2:00 pm CST. This week's focus is the Best Catch Bundle. 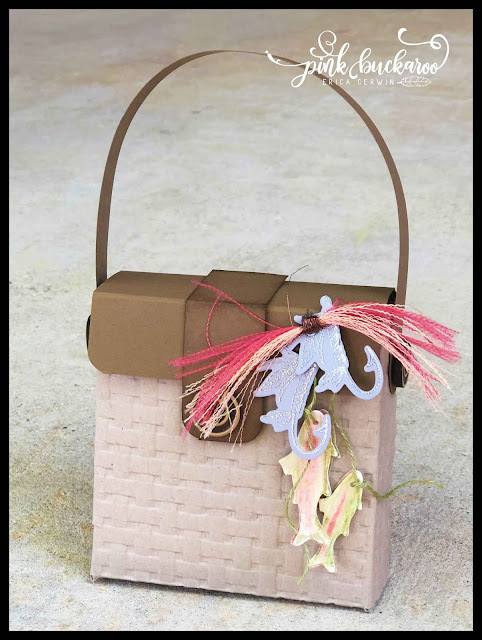 This week, I'm making lots of fun masculine projects using the Best Catch Bundle. It's a great set for all the guys in your life! My guys all LOVE to fish, so I knew this one would get alot of use in my stamp room! Today's project is actually a CASE of a project in our Demonstrator Magazine, Stampin' Success. It's an advanced project for sure, but I hope to show you how to simplify it a bit. This little basket is designed to look like a fishing basket. Isn't so cute? It's got lots of steps and I don't think I'd want to make a bunch of these for a big event. But, I'd love to make a couple for those very special guys. It can hold treats, a gift card or a small gift. The fly hooks (is that what they're called?) 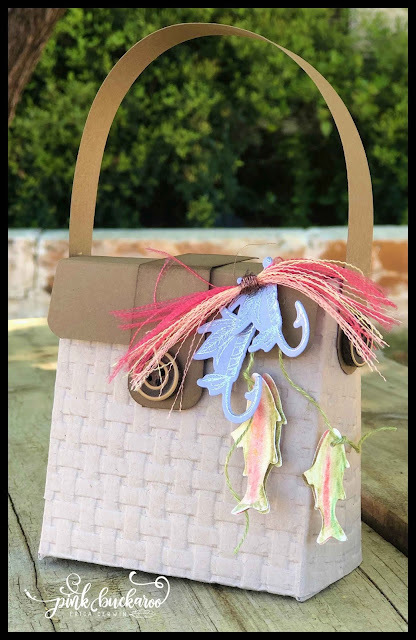 are embossed in silver embossing powder and the fish are colored with Watercolor pencils. The basket is held closed with a magnet. You can find the magnets here. score the long side at 1 7/8" and 5 5/8". Score the short side at 3 3/4"
Make a tic mark at 3/4"
Score the short side at 1" and 2 1/4"
If you'd like to order any of these products, make sure to use Host Code XM674YZS. I'll send Friday's three Best Catch make and takes to anyone who places a minimum $30 order by Monday (April 8th) at midnight for FREE!! You can find the complete list of supplies below. 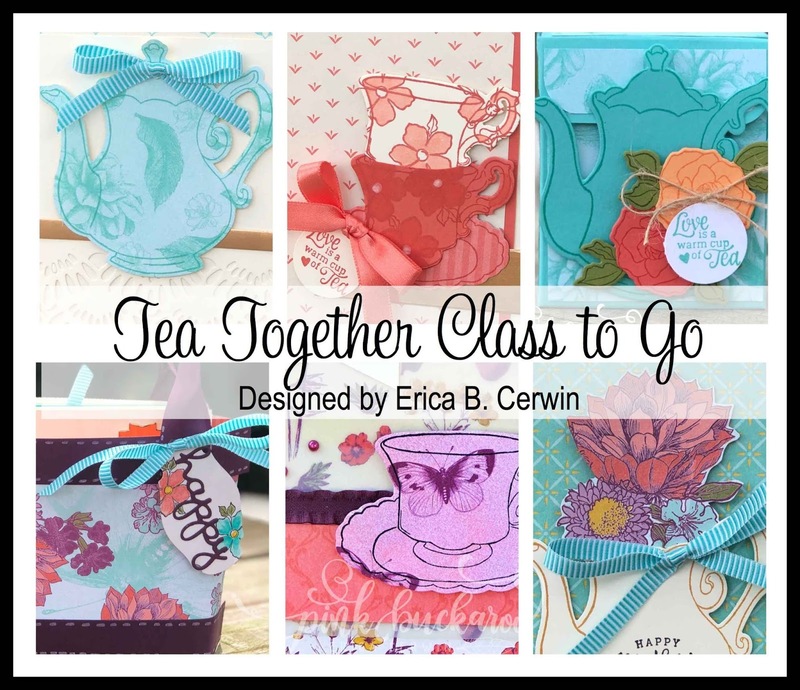 Don't forget to join me on Friday at 2:00 on Pink Buckaroo Stampers Group for three more Best Cath projects! See you then! So super cute Erica, thanks for the great ideas to do with this set other then cards! Have fun on Onstage next week. Shared! Thank you so much for redoing this basket! When I saw it in our magazine I fell in love with it. But just couldn't get it right. I called my upline & everything.Lol! So when she gave me your link I was so excited. So "Thank U"!